Used Cars Dealers in Phoenix, AZ : How to Wash and Wax Your Car! Ever wonder the best way to wash and wax your car? Here are 3 easy steps from the used cars dealers in Phoenix, AZ and experts at Auto Action! With the winter season subsiding and beautiful weather on the horizon, car buffs and vehicle owners alike are ready to get their cars on the road and looking great. Cleaning and waxing your car are some of the most basic maintenance car tasks that an owner can learn. The key is to doing it right, in order to keep your car’s exterior and interior lasting as long as the mechanical components. Follow these simple tips to avoid hazy looking paint, dull headlights, and dirty crevices. Cars get dirty–no matter what season it is–inside and out. 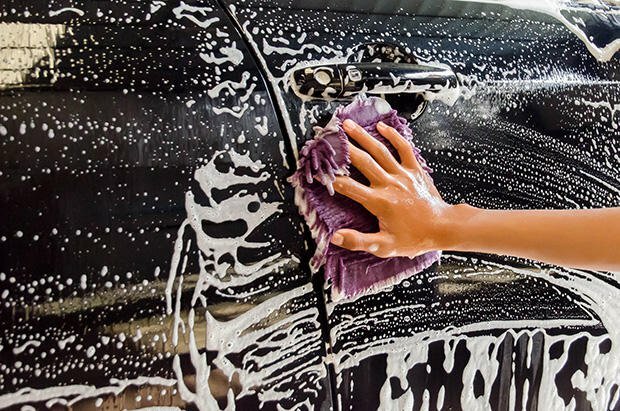 On the outside, you car is susceptible to minor soiling like dirt and rain spots, as well as more serious contamination such as industrial pollutants, acid rain, tree sap, bird droppings, and dead bugs which can all degrade your vehicle’s paint. Keeping your car cleaned and waxed can help repel water and pollutants. Begin by parking your car in the shade and thoroughly washing your car’s exterior with car shampoo. Opt for washing it by hand with soft cotton towels, this allows you pay attention to details and problem areas on your car (i.e. rust spots, you don’t want to be abrasive). Pay particular attention the car wheels and undercarriage and rinse all the dirt, chemicals, and debris off them by using a hose. The interior of the car, is just as likely to be sullied with sweat, dirt, coffee spills, and abandoned French fries. Shampoo the cloth seats to remove the grime by using a proper car-washing solution. If you have leather seats, use proper leather cleaner and conditioner to replenish the skin’s natural oils. Clean the window glass last to catch all the over sprayed cleaning products. Before start applying wax to the body of your car, wipe down any unpainted bits of trim with a quality protectant. You want to do this before you wax because it will allow any wax that gets on the chrome trim to be removed easily. Spray the protectant directly to your cotton cloth, wipe on and use a clean, white cloth to wipe it off again. Less is more when it comes to applying wax. You want to apply a thin layer of wax over a small section of your car at a time, otherwise it will be much more difficult to get a thick layer of wax off. The point is to create a thin layer of wax to seal out any water or dirt. Follow up a quick wash and dry with a light spray of detailer and wipe down with a micro­fiber towel for months of protection from the environment and clean up any water spots on the windows– inside and out. If you follow these simple steps you can protect your car from further damage, and keeping it looking and performing its best for years. If your are in the market, and looking for new or used cars dealers in Phoenix AZ, call Auto Action at 602-345-8000 today! We can help you find the perfect vehicle this Spring or anytime you need a new car.